With characters named Jack Spratt, Mary Mary, Goldilocks, and the Gingerbreadman, there is no doubt of the nursery rhyme connection to this murder mystery. 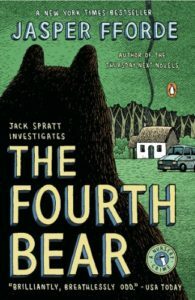 In The Fourth Bear author Jasper Fforde blends some familiar characters with a murder mystery. Jack Spratt heads the Nursery Crime Division of a local police department and investigates crimes by nursery characters. This is not one for the kiddies as Mr. Gingerbreadman may not be very cutsey and the fourth bear is one to watch. The novel has a lot of humor and while knowledge of nursery rhymes is not a necessity, it does help. This article was published on Aug 11, 2018 . It is tagged Jasper Fforde, The Fourth Bear. You can follow any responses to this article through the comment RSS feed.